The enormous cannon standing in the grounds of the Kremlin is a masterpiece of medieval gun casting. But according to legend, the cannon has never actually been fired – or has it? 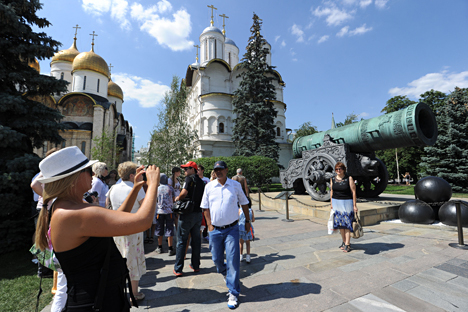 Standing in a central spot inside the Kremlin walls, a giant ornate cannon has long symbolized the Russian capital, its sheer size and presence spellbinding visitors. Few guns can measure up in weight and there is no larger bore howitzer in the world. Almost a meter in diameter, the cannon balls lying beneath the muzzle testify to the unimaginable force of this ancient weapon that still guards its secrets. Beyond its proportions, the 40-ton behemoth called the Tsar Cannon is also a remarkable example of fine medieval gun casting and the embodiment of six centuries of Russian artillery technology. The first cannons appeared in Russia earlier than in most of Europe, built with knowledge acquired from the Tatars, who themselves mastered the gunsmith’s art from the Chinese in the 13th century. One story has it that the first Russian gun-maker was a Tatar called As (Ace) who was captured during the Battle of Kulikovo in 1380. Two years later, the attacking forces of the Tatar khan Tokhtamysh were beaten back by sophisticated guns mounted on the Kremlin walls. Russia did not lag far behind its European neighbors in gunnery development. By the end of the 15th century, Russian artillery forces comprised several hundred guns, with 55 of these set on the walls of the fortress of Novgorod. Characterized by ever greater numbers and quality, this artillery boom occurred during the reign of Ivan the Terrible. In 1552, just one Russian army besieging Kazan fielded 150 guns, and Russian cannons also went on to shatter the walls of Lithuanian, Polish, German and Swedish cities. By the end of the 16th century, Russian cannon masters had consolidated their reputation as among the world’s best. They not only built and maintained one of Europe’s largest artillery arsenals but devised models of weapons with no parallel in the West. It was under Ivan the Terrible that gunsmiths first added grooves to the interior walls of barrels - an early step towards spiralled rifling that appeared in the 19th century. Oblong shells, fixed front and rear sights, and breech loading systems are all innovations by Russian cannon masters who were way ahead of the times. Medieval Russian chronicles document a number of prolific gun casters, the most famous of these being Andrei Chokhov, who made the Tsar Cannon in 1586. Conceived as the greatest menace of its time, the five-meter-long monster was designed to hurl 89 cm-wide stone cannonballs weighing almost a ton over a kilometre (0.6 miles). It was supposed to stand on the Kremlin wall for the defense of Moscow but proved too large to anchor firmly. For more than a century Chokhov’s creation stood on Red Square near St. Basil’s Cathedral, and was only moved into the Kremlin in the 18th century. In the early 19th century the Tsar Cannon attracted the attention of historians due to its immense size and barrel cast with equestrian reliefs of Tsar Fyodor, crown and scepter in hand. As one of two surviving portraits made of the son of Ivan the Terrible in his lifetime, the ornate depiction also inspired the gun’s name. Kremlin architects set the piece on a gun carriage and, for added effect, placed several large cannon balls under its muzzle. These were pure invention, however, since firing metal rounds would have wrecked a medieval weapon of this caliber. It is also precisely because of its size that the Tsar Cannon was for a long time thought to never have been fired. But in the late 20th century expert analysis revealed that it had thundered at least once. Some historians believe that the cannon was used on May 27, 1606, to shoot and disperse the ashes of ‘False Dmitry’, a usurper who seized the throne while pretending to be Ivan the Terrible’s son. True or not, the Tsar Cannon is one of the few remaining examples of traditional Russian cannon casting. If its immense size rendered it impractical as a weapon, these dimensions also prompted Peter the Great to spare it when he smelted down the entire Kremlin artillery arsenal to rebuild it along European lines. Two mortars also survived this technological purge and are now exhibited in St. Petersburg. And coincidentally or not, these were also made by Andrei Chokhov.